I can see from my Turkey stats that the numbers are down and I am not at all surprised. Things are very tense here right now. Today I woke up and all I felt fit for was plumping the cushions. But I had a busy agenda. Tomorrow is our little Eva’s second birthday and Nana has to make a cake! Somehow I was all a-jitter so thought I would start with something I can make with my eyes shut: chocolate chip cookies. This had the effect of making me pull myself together even though I discovered to my consternation that I didn’t have any raisins. However I did have dried cranberries so I reasoned they would have to do. I was in my shorts and wasn’t about to change for the sake of going out to buy a few raisins. When I had made them – about 3 dozen – I hid them. Yes, dear Reader. I hid them. I have son Cem here plus TT and I know them very well. We hardly have anything sweet in the house these days thanks to the famous Dukan diet we have been following, so I knew only too well that the enticing smell of those cookies baking in the oven would drive them to distraction. Take it from me, I was wise to hide them. Talking about the Dukan diet: both TT and I lost 7 kilos in the first let’s say 7 weeks. Despite doing a lot of travelling since April, we have both managed to keep this weight loss off. I have lost a further kilo this week thanks to events here. So I heartily recommend the Dukan. You lose a tremendous amount in the first 3-5 days when you eat only protein. But the point is that you do indeed change your patterns of eating. I now use very little olive oil in both salads, zeytin yağlıs, and when sautéing eg onions. And I have barely eaten any carbohydrates since February. I feel that these are changes for life. Anyway, the next task was the birthday cake. I knew that Daughter No2 wanted a devil’s food cake. I had been going to make my trusty never-fail fudge cake from An American Cook in Turkey that I have been making all my life. I thought, she wanted the devil’s food, OK, I’ll make that. However, all did not start well. This was a different recipe not Nigella’s, with an old-fashioned layout that was not all that clear. It started off with the instruction to ‘put all the ingredients in a large mixing bowl ….’ so I did. But then my subconscious told me that for a devil’s food cake, this couldn’t be. And sure enough, no. This was for the icing not for the cake itself. Aarrrgh. I had to fish out the chocolate from the milk and brown sugar, then gauge how much sugar I had used etc. Then mistake no 2: I should have added the melted chocolate mixture to the creamed butter, sugar and eggs, but somehow I overlooked this fine point. Arrgh Nana, what are you doing??? Instead I continued with the sieved flour and bicarb of soda. Then reality hit and I realised I had omitted the all-important chocolate mixture. So I really didn’t have too much faith in those cakes in the two tins rising. But they have. Preheat oven to 180C/350F/mark 4. Line 2 190mm/7½ in sandwich tins with greaseproof paper after first greasing the tins. Break the chocolate into small pieces and place in a saucepan. Add 75g/3oz of the brown sugar and the milk. Heat very gently stirring all the time to dissolve the sugar. 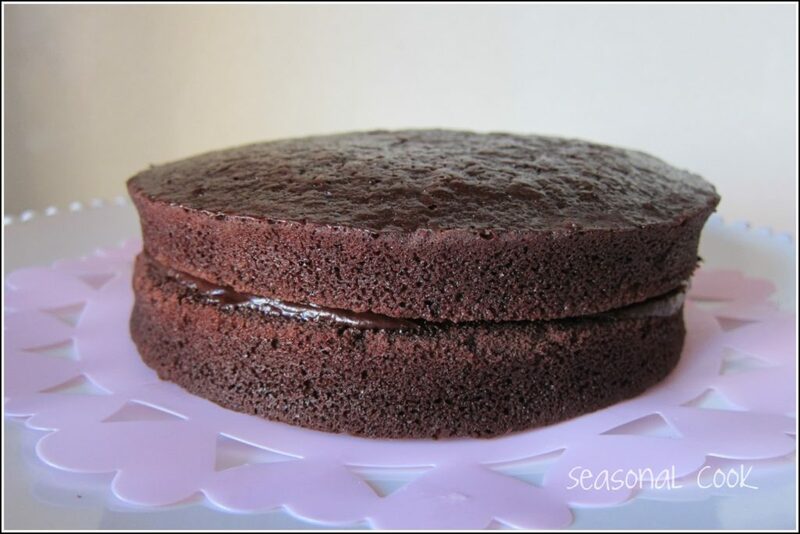 As the chocolate melts, evenly blend the ingredients, then remove the pan from the heat and leave the mixture to cool. Using an electric mixer, soften the butter. Add the remaining brown sugar, a little at a time, and cream for 2-3 min. Lightly whisk the eggs and gradually beat into the creamed mixture. Slowly pour in the cooled chocolate mixture and continue beating until all the ingredients are combined. Sieve the flour and bicarbonate of soda into the mixing bowl and gently fold in using a metal spoon. Do this carefully otherwise you will knock out the air incorporated during the creaming process. Pour the mixture into the prepared tins, then tap the tins gently to level it off. Place the tins on the middle shelf of the oven and bake for about 35 mins. The cakes are ready when they have risen and slightly shrunk away from the sides of the tins. They should just spring back when lightly pressed with fingertips. Leave them to cool in their tins for a couple of minutes before turning out. Carefully ease them away from the sides of the tins with a knife. Turn them out onto a wire rack, pull off the paper and leave to cool. Put all the ingredients in a large mixing bowl with 60ml/4tbsp water. Place the bowl over a pan of simering water and using an electric hand mixer, whisk the ingredients for about 5 min, or until the icing is thick and stands in stiff peaks. Use to fill and top the cake, eat the same day. Do not freeze this icing. However, you can freeze the cake when it’s iced. Storage life is about 6 mnths.I plan to decorate the cake with bonibons, the local equivalent of smarties! I’ll let you know how the icing works out. I happen to have a tin of condensed milk in my cupboard. Meanwhile, just to let you know, the situation here continues. My walks go on, I just had one on Saturday with 7 lovely American visitors and we had a great day. The protests are non-violent – I have been to Taksim Square myself and what strikes you most is the prevailing spirit: peace and unity. My lovely blogging friend Özlem from Özlem’s Turkish Table and I have decided to continue cooking and sharing our recipes as best we can. It’s hard to think of cooking under the circumstances but we want to stay connected and keep Turkey on the agenda in as positive a way as possible. everything looks so good. i bought my first cherries today. they were so so. i will wait a bit longer before i buy more. 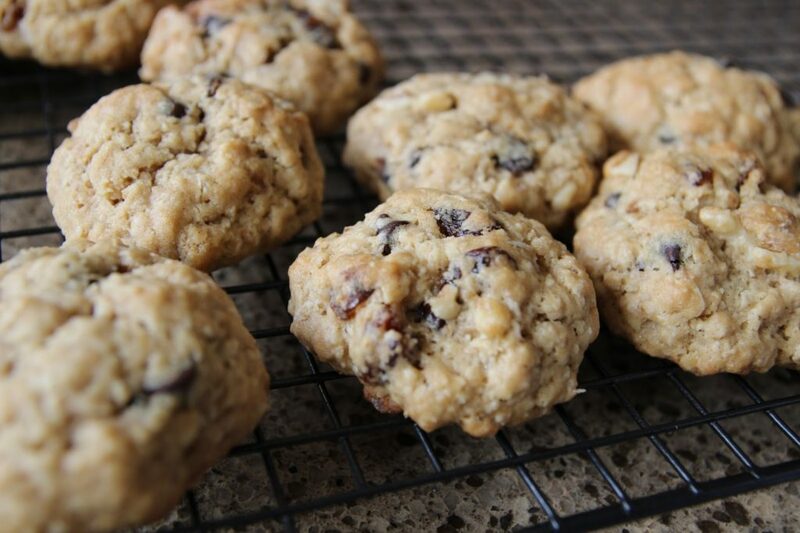 My chocolate chip cookies rarely have the chewy and puffed quality of yours…..Adding the dried cranberries is a nice flavor enhancement. Yours look awesome. The Devil"s Food cake too. Wishing you peace in Turkey. Thank you for taking time amongst all the stress to share with us your delicious food. Congratulations on your weight loss…my friend is on the Dukan Diet and lost 40 lbs. 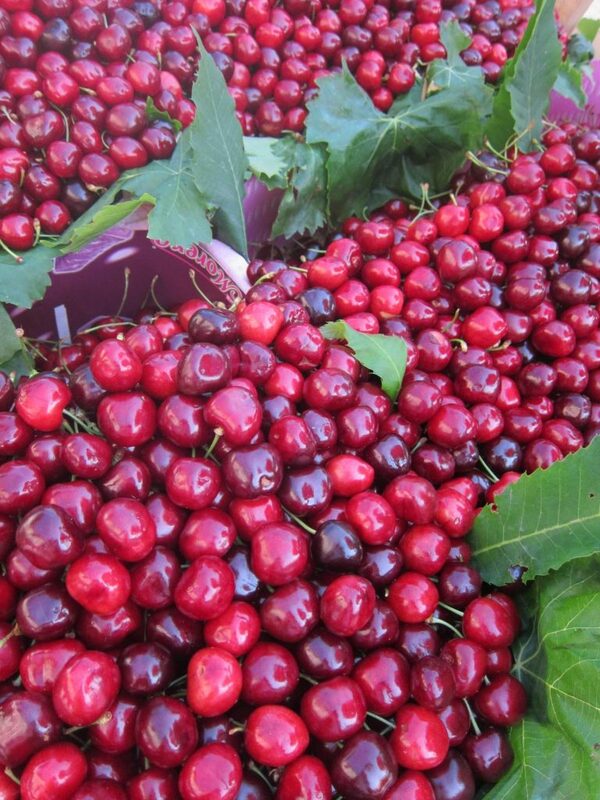 Everything looks so yummy and delicious and when I was in Izmir we managed to buy some cherries, very sweet and luscious. We have some for sale here too but someplace from the US. I follow on the news what's happening in Turkey, everyone I know just wants Erdogan to go away. When I was in Turkey every conversation I could hear people complaining about him, and that was a week before the demonstrations started. Hope this is solved peacefully and doesn't linger on….can't believe what I see in the news here on what Taksim looks like sometimes. Take care…. Thank you, October Farm, Velva and Erica, for your lovely comments. We too hope it will all end without undue violence. It really takes away my appetite! Claudia, I was really laughing during your description of making the devil's food cake. Honestly, no matter how experienced a cook is, when one feels a bit out of sorts about something – well, suffice it to say, I've been there. That's when having a well-formatted recipe is so important, isn't it? BTW, I adored the purslane salad recipe with the tahin and fındık. I made it for an American friend who came out here to the island to visit us after spending several nights in a hostel near Taksim and visiting the protests, almost on a nightly basis. Thank you for your kind mention Claudia; our heart beats for Turkey, i think of my homeland constantly. But as you say, I feel the need to keep going, keep sharing, with these positive thoughts and reminders in mind. Kalbimiz sizinle ve eline saglik! I will be making chocolate chip cookies today for my granddaughter too. I hope the demonstrations continue to be peaceful. My Turkish friend is visiting her Mother in Turkey right now and she will be joining us in Paris on Friday for the beginning of our motorcycle tour of France. Stay safe. beautiful cookies and beautiful cake!! I send all good wishes for this difficult time and hope everything settles down very soon. I so agree with you on cutting out the carbohydrates – it makes SUCH a difference! Congratulations on keeping the weight off – this is a real achievement considering all the travelling you have done.